The four teenage girls set out ahead of me and their leader, Grace. As part of the Advanced Birding Camp offered by Sea & Sage Audubon Society, we planned to walk around the ponds at San Joaquin Wildlife Sanctuary in Irvine, Calif. The overcast morning offered a nice setting for the daily bird walk. At Pond E, the girls quickly called out Great Blue Heron (standing on one leg atop a telephone pole), Mourning Dove, Great Egret, Black-necked Stilt, American Avocet. Then, the campers began trying to I.D. three unfamiliar, similar birds among the Mallards on one bank. Grace and the teenagers started calling out the field marks while looking through their binoculars and a spotting scope: "I see a definite white eye-ring... The legs look yellow... The bill seems to be straight... Its feathers are all speckled." More campers arrived, holding their notebooks and pencils and field guides, and opinions started filling the air: Great Knot, Pectoral Sandpiper, some kind of yellowlegs. A walkie-talkie allowed the leaders to summon another adult birder to offer a definitive opinion. She soon looked through the scope and named it a juvenile Greater Yellowlegs. Puzzle solved. Now, on to find another one. At the next body of water, Pond D, we saw a baby Black-necked Stilt and a Killdeer feeding on the mudflats and watched Wilson's Phalaropes spinning in the water. Adult and immature Forster's Terns surrounded a group of Long-billed Dowitchers, and Snowy Egrets added some height to the crowd. At Pond C, the Least Terns busily hunted for fish and constantly called, just as the teenagers constantly chattered about this or that bird. A Ruddy Duck swam on the west side near the reeds, near the juvenile Black-crowned Night-Heron. An adult birder alerted Grace to a unique bird near the back of Pond C. The teens walked north toward the dogleg and peered at the ducks. There -- by the white pole -- a duck with a red head swam in alternating directions. Was it a Redhead? Check the color of the bill and the color of the eye. What about the slope of forehead? Was it a Canvasback? Opinions hovered above the group as the teens again looked in their field guides and peered through their binoculars and the scope. Final verdict: Canvasback, due to the shape of its head and the red eye. A Pied-billed Grebe swam by itself in the dogleg, and an Eared Grebe briefly showed off its red eye before submarining again. Turning to the east side of the path, facing Pond D, one of the girls spied a Semipalmated Plover through the scope and on the mudflat in the back. And then came an excited squeal: Virginia Rail in the reeds! The delighted squeals increased in number and volume. Quick dances of joy erupted. The spotter received hugs and adoration. It was a Good Day for a bird walk. 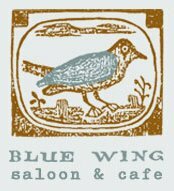 I recently became aware of Blue Wing Saloon & Cafe, which serves Blue Wing wines. At the grocery store, I see bottles of Little Penguin, Duck Pond Cellars and Ravenswood wines. Do you know of other eateries and liquid consumables with avian-oriented names and artwork? Would you recommend them to other birders? For your viewing pleasure, here's a Flickr set of the 2005 photo-contest winners. If you view the set as a slideshow, you'll miss the captions that identify the bird and the photographer. If you want those details, it's best to click through the set. Enjoy! The winning images in the 2006 photo contest appear in the September/October issue, which should arrive in mailboxes in the next week or so. The recent promotional materials from National Audubon Society arrived in an envelope that depicted a Bald Eagle on the front with the words "Is their time running out?" That struck me as kinda... ironic. Our national symbol has recovered sufficiently that the U.S. Fish & Wildlife Service is considering the removal of Bald Eagle from the federal endangered species list. The biologists who monitor the raptor apparently have enough data to argue that the population in the lower 48 states is secure enough to warrant "delisting." Then isn't it inaccurate to give the impression that the eagles are in danger and that their time might be running out? Your thoughts? That's how the editors of Arkansas Times described the Ivory-billed Woodpecker today. The ivory-billed woodpecker male who was checking out the Bayou de View is probably in the White River National Wildlife Refuge, if Cornell’s sound recordings are right. Head down to southeast Arkansas, find this baby’s roost hole, and claim a host of prizes, including good will, fame, and the everlasting gratitude of the Cornell Lab of Ornithology. Get a picture and send your kid to college. (A slight exaggeration, but you never know.) If you miss the bird, you still might see the swallow-tailed kites that started their return to the Big Woods nearly a decade ago, and that alone is worth the trip. The Rio Grande Valley Birding Festival website recently shared this year's artwork by John P. O'Neill for the 13th annual event, which'll take place Nov. 8-12. Haven't been to a festival? Want to see what it's like at the Harlingen event? Take a peek here and here and here and here and here and here and here. 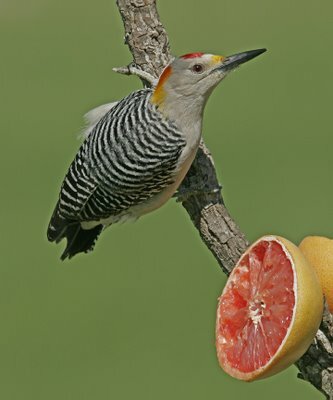 No matter how many times I've visited south Texas for the Great Texas Birding Classic or WildBird's Birder of the Year trip, I look forward to the chance to see great species that don't occur elsewhere, to hang out with the hospitable residents and to eat really good, inexpensive Mexican food that hasn't been Californized. There's no dearth of good writers in the birding blogosphere, and it'd be a pleasure to see them turn their minds to crafting short stories about birds, birding and birders. Clare Kines of The House & Other Arctic Musings wrote the winning entry for the first edition, an intriguing tale called "The Climb." For the purposes of First Friday -- the monthly birding fiction contest -- we define an appropriate entry as a fictional piece of 500 words that contains a setting, a character or characters, a conflict and a resolution. One more stipulation: The birds will not be anthropomorphized. The writer of the winning entry can choose a recently published book from the bookshelves of the WildBird office, where we regularly receive review copies of new titles. Because the book reviewer chooses only three titles per issue, I can offer a nice selection of books to the winning wordsmith. The second edition of First Friday will appear on Aug. 4, with entries due via e-mail on Wednesday the 2nd. Please send them as Word or text files. The former governor of Idaho, Dirk Kempthorne, chose Peregrine Falcon as the design for the reverse (or tails) side of the Gem State's coin, part of the U.S. Mint's 50 State Quarters program. Begun in 1999, the program releases five coins a year in the order in which each state joined the Union. Idaho's coin will appear in 2007, after Montana and Washington but before Wyoming and Utah. 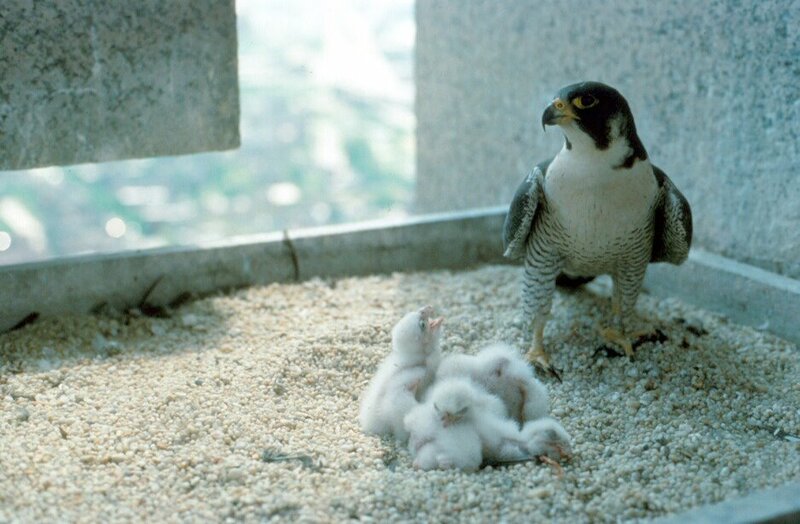 The facility, World Center for Birds of Prey, stems from The Peregrine Fund. The center's staff captive-bred more than 4,000 falcons and released many into the wild. The species no longer appears on the federal endangered species list. Idaho's state-quarter design isn't the only one to feature a wild bird. Naturally, the governor of South Carolina chose a design with a Carolina Wren for the quarter's release in 2000. Later, the governor of Louisiana chose artwork with a generic pelican (or is a Brown?) 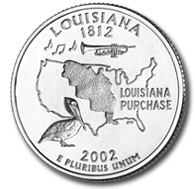 for the Pelican State's quarter, which appeared in 2002. 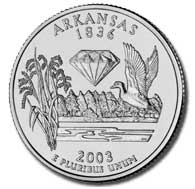 The following year, the coin from Arkansas -- the Natural State -- featured a Mallard. 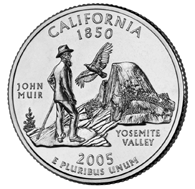 The Golden State's quarter appeared in 2005 and featured a California Condor soaring above Yosemite. The 2008 releases include Oklahoma, New Mexico, Arizona, Alaska and Hawaii. What are the chances that we'll see birds on more state quarters? You can purchase state quarters directly from the U.S. Mint. 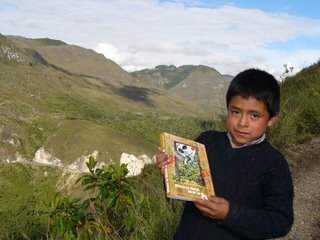 The winning images for the 2006 contest will appear soon in the September/October issue. In the meantime, I'm going to share some of the 2005 winners. During this morning's dorkwalk, I heard a cat's collar-bell jingle as it leapt into the tall tree in the house's front yard along Broadway. The furry predator obviously knew how to maneuver amid those branches. A hawk then flew into the branches. Sharp-shinned or Cooper's? I couldn't tell; its head wasn't visible amid the leaves. The cat's focus latched onto the hawk's position. The four-legged creature began looking at the nearby branches and figuring out how to get to the raptor. It nimbly hopped a couple times before the hawk flew to a farther branch. I began wondering, "Should I do something here? I sincerely doubt the cat will get to the hawk... but if it gets really close, I'll try to distract the cat." Honestly, how arrogant is that to think that I could protect a bird of prey, that it would need my assistance? The dance between the cat and hawk lasted maybe two minutes. The pet never got within seven feet of the bird, which abruptly left the tree. Now I'm wondering about leaving an ABC Cats Indoors flyer on the house's mailbox. What do you think? A friend recommended this book by Elizabeth Gilbert. 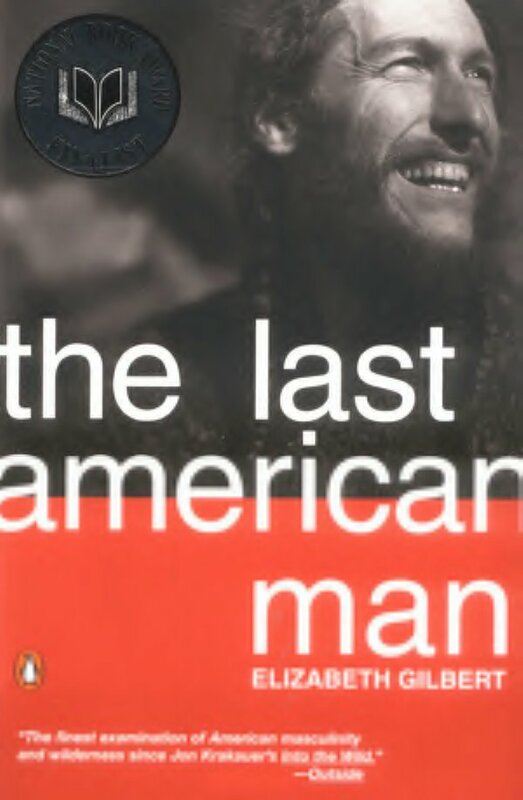 It tells the story of North Carolina resident Eustace Conway and weaves an examination of American masculinity with a reflection of nature's role in our modern society. I thought these two passages to be particularly relevent, and maybe birders can relate to Conway's advice to a young man, given birders' typically heightened level of awareness of their surroundings. Eustace used his time with Dave to try to have him understand the fundamental essence of his philosophy, which centered on mindfulness. There is no way, Eustace said to Dave, that you can have a decent life as a man if you aren't awake and aware every moment. Show up for your own life, he said. Don't pass your days in a stupor, content to swallow whatever watery ideas modern society may bottle-feed you through the media, satisfied to slumber through life in an instant-gratification sugar coma. The most extraordinary gift you've been given is your own humanity, which is about consciousness, so honor that consciousness. Revere your senses; don't degrade them with drugs, with depression, with willful oblivion. Try to notice something new every day, Eustace said. Pay attention to even the most modest of daily details. Even if you're not in the woods, be aware at all times. Notice what food tastes like, noticed what the detergent aisle in the supermarket smells like and recognize what those hard chemical smells do to your senses; notice what bare feet feel like; pay attention every day to the vital insights that mindfulness can bring. And take care of all things, of every single thing there is--your body, your intellect, your spirit, your neighbors, and this planet. Don't pollute your soul with apathy or spoil your health with junk food any more than you would deliberately contaminate a clean river with industrial sludge. You can never become a real man if you have a careless and destructive attitude, Eustace said, but maturity will follow mindfulness even as day follows night. This short article, "Wildlife photography made simpler," talks about digital vs. film photography, includes quotes from WildBird Advisory Board member Arthur Morris and falls in line with my experience via the annual photo contest. Digital entries became part of the mix in 2004, and their presence has increased dramatically. This year, about half of the entries arrived on CD. Do you use a film or digital camera? If the latter, do you use a point-and-shoot or an SLR? Why? Think a magazine editor's job is glamorous? Don't forget to check out the newest edition of the birding blogosphere's carnival, hosted by Katie. The variety of participants gives this edition a fun, international flavor. * Whenever you mention my name (in the blog), it must be followed by the phrase "Dean of American Birders"
* The wife will probably be coming along. If so, when you mention the two of us, you will refer to us as a "power couple"
The Department of the Interior allotted $256 million to restore wetlands in national wildlife refuges, rebuild facilities and begin hurricane recovery projects. 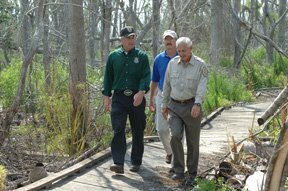 Secretary Kempthorne visits Bayou Sauvage National Wildlife Refuge in New Orleans. 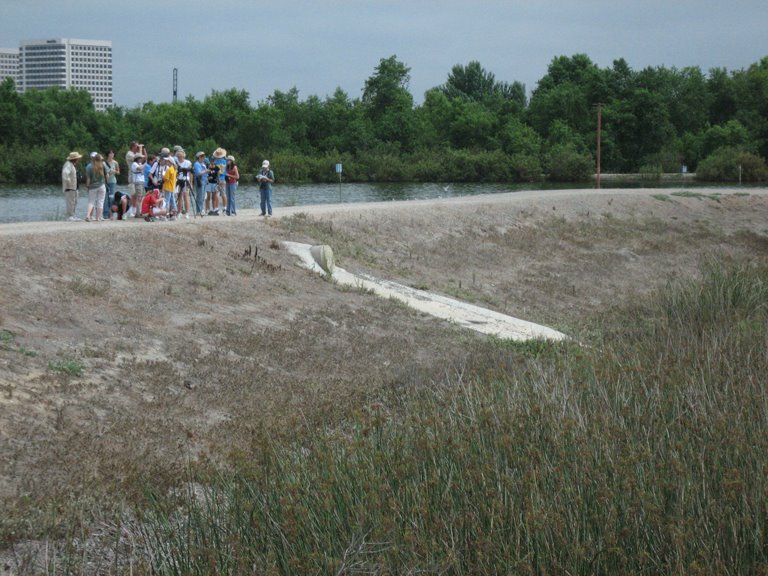 Louisiana contains 45 percent of the country's coastal wetlands, including 10 NWRs and one national park. 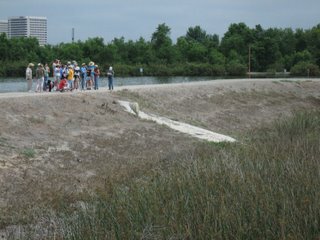 “Our national wildlife refuges and national parks contribute to the larger solution by restoring their levees, clearing their marshes and wetlands of debris, and working with state and local partners on long-term, common-sense solutions to halt the accelerated loss of coastal wetlands,” Kempthorne said. So, think we'll see evidence of those funds during the American Birding Association's annual convention in Lafayette, La., next April? 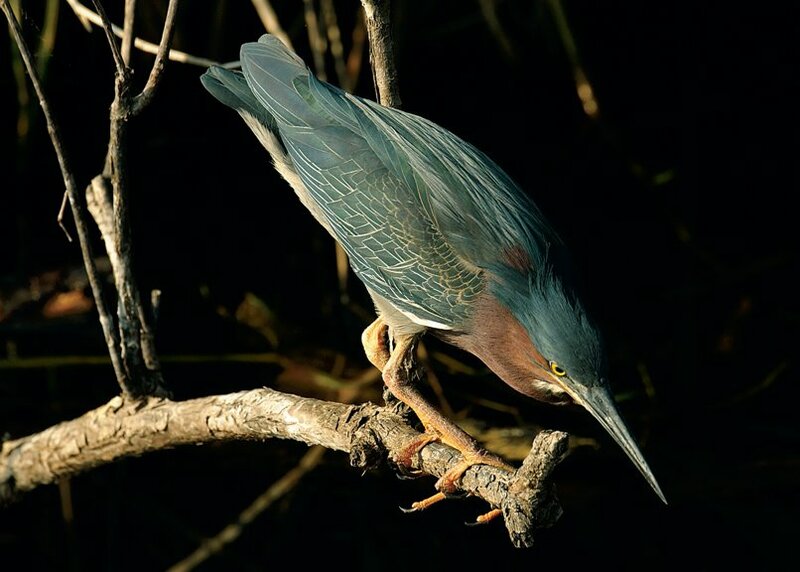 Thanks to the American Bird Conservancy and its Peruvian partner Asociación Ecosistemas Andinos, a conservation easement in northern Peru will protect Marvelous Spatuletails and bring more tourist dollars to the area. Despite its remote location, the area where the hummingbird lives is already known to birdwatchers. In order to find the species, it is often necessary to commission the services of one of the world’s youngest bird guides, 10-year-old Solomon Ortiz-Perez, who for a small fee will lead eager groups of bird tourists up steep slopes to search for the bird. 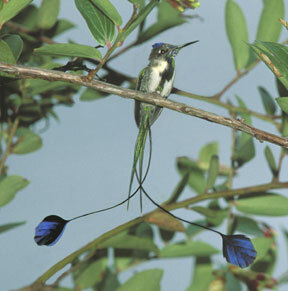 The spatuletail is fast becoming a flagship species for tourism in the area and has already appeared in travel advertisements in American magazines that aim to attract keen birdwatchers to the bird’s remote habitat. It has also been declared the “Regional Bird” for Peru’s Amazonas region. Have you heard of a Liberty Owl? Neither had I until this morning. Can you guess which owl it is? Here's a brief description of the species. Are you living with a heat wave these days? Perhaps you'd like a respite, and maybe these images from the American Birding Association's convention in Bangor last month will cool you off, if only mentally. Tomorrow, 28 captive-bred Aplomado Falcons will start living in west Texas. Raised by The Peregrine Fund, the endangered raptors will spend five to seven days in protective boxes on top of hack towers, receiving food and becoming accustomed to the new climate before being released. 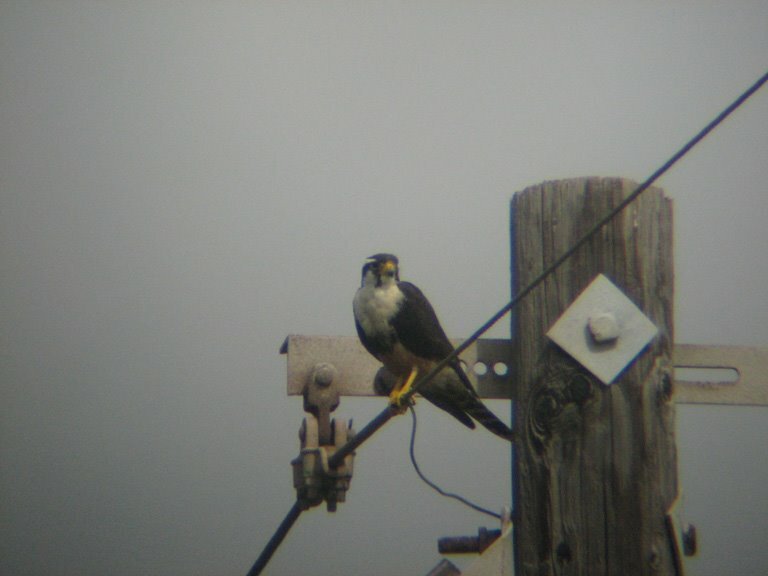 The falcons' reintroduction to the region results from the collaboration of the Fund with the Texas Parks and Wildlife Department, Texas Hawking Association and private ranchers. The latter group hosts the hack towers and conserves habitat for the birds of prey through a Safe Harbor Program coordinated by the U.S. Fish & Wildlife Service. The last few days, the comments to last Monday's post have been rolling around my head. I wanted to know when folks began to use "birder" in addition to "birdwatcher," who created the distinction between the terms and how the different attitudes developed. Are the terms helpful, exclusionary, confusing? Then John posted some thoughts this morning. I trace my first exposure to the term birder with the formation of the American Birding Association in about 1970-1971. I was initially (and still am, to some extent) turned off by the ABA's emphasis on listing. 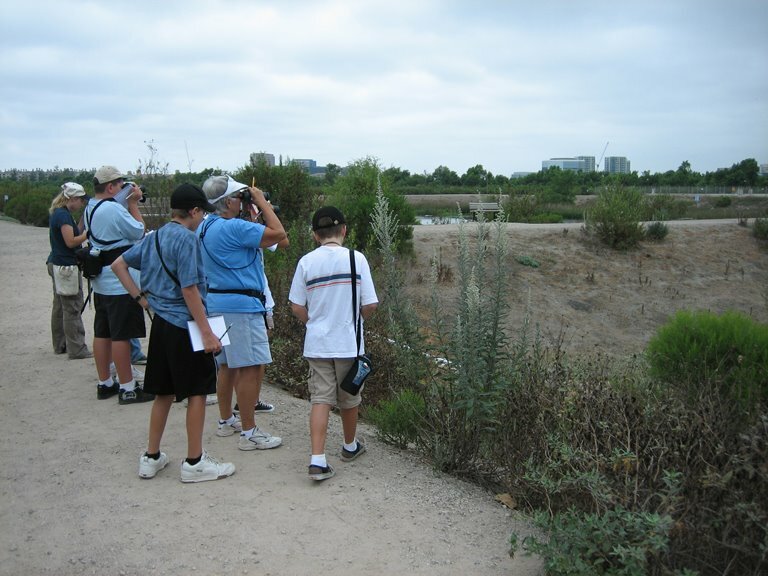 Among the birding elite, a birdwatcher may be viewed with some disdain as someone who is less accomplished or sophisticated in the identification of birds, even though that person may be extremely knowledgeable about the birds of their backyard or neighborhood. ... These days I generally identify myself as a birder (not wanting to be derided as one of those birdwatchers! ), though I remain much more interested in watching (and listening) than in mere listing. So who else became aware of "birder" via ABA's genesis? How common is it to encounter "birdwatcher" used derisively? I know a fair number of listers who maintain various tallies but know tons about the birds' behaviors, calls, songs, etc. Are they unusual? Maybe, maybe not... but they're more than I.D. collectors. They're well-versed naturalists who think of listing as a game that adds even more fun to birding, not as the point of birding. 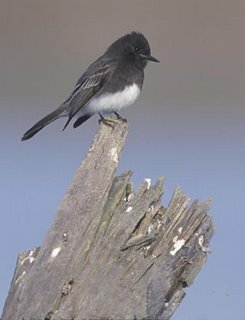 It can be easy to categorize ourselves and our birding companions into black-and-white groups. I wonder, though, if it's to the community's detriment. Clare Kines of The House & Other Arctic Musings won the inaugural edition of First Friday. 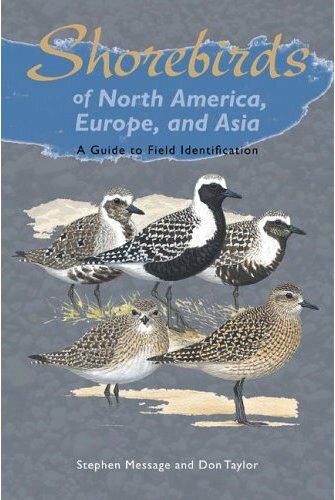 In recompense for his well-crafted birding fiction, he received his choice of recently published books, and he picked Shorebirds of North America, Europe and Asia, a review of which appeared here. The second edition of First Friday will appear on Aug. 4, with entries due on Wednesday the 2nd. I'm looking forward to seeing your short stories about birds, birding and birders! Did you hear about the recent tern tragedy in Southern California? The bodies of young Caspian and Elegant Terns washed onto the shore of Long Beach Harbor, the apparent victims of high-pressure hoses that cleaned off the decks of privately owned barges on which terns had nested. In the short term, given the squeeze on real estate for colonial seabirds in our coastal region, these barges should either be seized from their owners and devoted in perpetuity to the terns of Long Beach Harbor, or fines should be exacted from those responsible and put toward the purchase, placement and monitoring of similar nesting barges in the harbor. If you build it, they will come. To my mind, the viable solution is the latter: "...fines should be exacted from those responsible and put toward the purchase, placement and monitoring of similar nesting barges in the harbor." We need to work with folks who don't share our nature-oriented sensibilities and who have to make a living--for instance, with those barges. We can't just seize the barges--which would seem to imply lack of remuneration for their personal property--and deprive them of their livelihood. Imposing the fines would seem to be sufficient punishment to the barge owners and notice to other owners about appropriate actions. The purchase of barges specifically for nesting terns appears the best option. So who's going to lead that effort? The results of the sixth annual America's Birdiest City and Birdiest County competitions have been tallied! 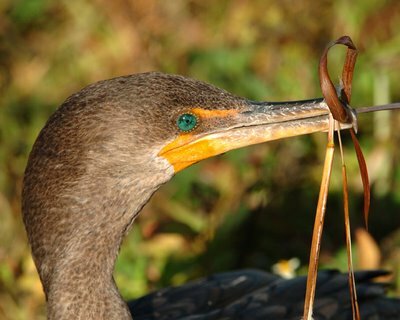 Many groups combine the competition with their annual Birdathon efforts to raise money for conservation or education programs. As with most competitions, certain rules need to be followed, but the main objective--other than identifying as many species as possible--is having fun. Dauphin Island Bird Sanctuaries will coordinate the 2007 contest and provide the rules, so keep your eyes tuned to that website. Congrats to the birders to secured bragging rights for their cities and counties! Remember to check in with these folks before April 2007! 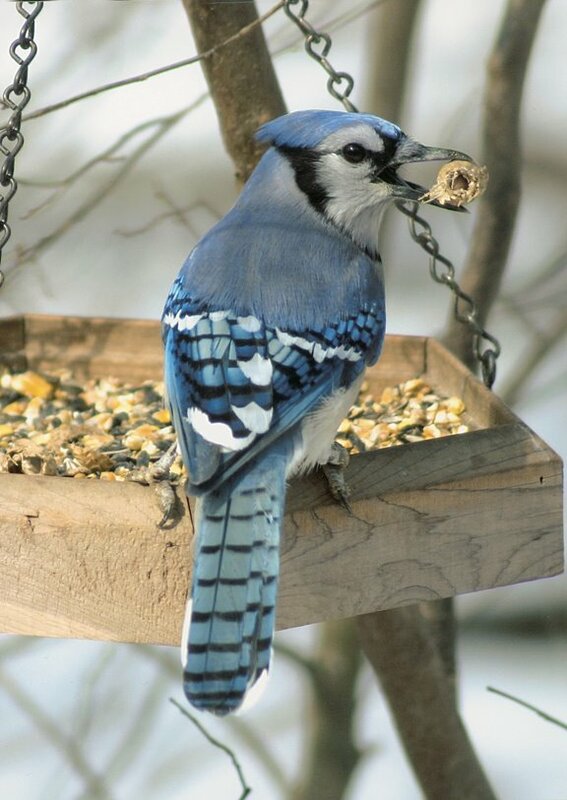 Have you come across other folks wearing binoculars and/or providing seed in backyard feeders who say something like "I'm not a birder but..."? I've noticed the phrase in letters to WildBird, too. That made me wonder: Why do the writers prefer to distance themselves from that word? How does "birder" differ from "birdwatcher" in their personal dictionaries? My definitions might be considered rather literal. I was under the impression that a birdwatcher enjoys and identifies birds by sight only while a birder also uses sounds to identify the hidden buggers. Is there more to it than that? Is it the level of activity or the extent of the pursuit of the critters? Is there a value judgment involved with the labels? Today's edition of The Arizona Republic includes an editorial titled "Protecting a Bird's Song." It refers to a recent study -- "Human impacts on the rates of recent, present, and future bird extinctions" -- from the National Academy of Sciences of the United States of America. The study's abstract says, "Extinction threatens 12% of bird species; another 12% have small geographical ranges and live where human actions rapidly destroy their habitats." "...researchers also found that even though 20 species have gone extinct since 1975, conservation efforts have kept an additional 25 species on the planet. That's the good news of environmental protection. It's the fertile middle ground between the sanctimonious folks who wag fingers and condemn every human endeavor and the champions of the status quo who insist there's no problem so big it can't be safely ignored. I'd like to think that most birders fit into the "fertile middle ground" rather than contributing to the number of that irritating species Sanctimonious Finger-waggers. The world has too many of those already. Let's focus on the simple and complex solutions cited in the editorial: fostering native plants for native birds and educating elected decision-makers so that they focus on "measures that represent sharing, not hogging, the planet." Congratulations to Clare Kines of The House & Other Arctic Musings! He created the winning story in the inaugural edition of First Friday. For his efforts, Clare can pick a recently published book from the bookshelves in the WildBird office. Woo hoo! If you'd like to have your pick of that largesse, write an original 500-word short story about birds, birding or birders that includes a setting, a character or characters, a conflict and a resolution. Also, the birds cannot be anthropomorphized. For the August edition of First Friday, please send your birding fiction on Aug. 2. Thank you to this edition's participants! Without further ado, here is "The Climb" by Clare Kines. This was how the Fall was supposed to smell, the smell of highbush cranberries after the frost. It had been quite some time since he’d smelled Fall and felt the crunch of bright yellow leaves and frost under his feet. and turned to look at the grove below him. 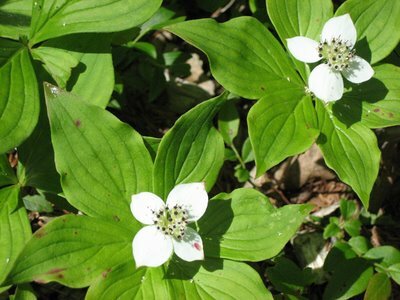 Small birds could be seen, flitting here and there in the canopy and the undergrowth. Unzipping his jacket, he reached in and pulled out the binoculars. Ever since he could remember, he had liked the weight of a pair of binoculars around his neck, the release as he lifted them to his eyes, and the heft of them in his hands. As he picked out the first tiny form and began the process in his head of running through the field marks, he wished he had his guide with him. Fall warblers were hard enough, without relying on memory. But that, that was a Wilson’s he was sure, and he watched it gleaning for insects in and out of a hazelnut bush. And wait, behind it, higher up, that was a Yellow-rumped, and farther off something else. A vireo? He couldn’t quite see it as it flitted through the remaining leaves of a small Birch. He had just noticed the thrush on the ground and was raising his binoculars when he saw it coming in fast from his right. The thrush, a Swainson’s, saw it also, but too late, and the Goshawk hit it with an explosion of feathers. He had barely time to realize what had taken place when the hawk settled down in front of him and began to feed. He identified with the hawk, vilified for what he had to do. Why couldn’t they understand that? Couldn’t they see that he had no choice? They couldn’t see that he had had to act, where no one else would. Why wouldn’t they just leave him alone? He watched the Goshawk ripping feathers from the thrush and he followed one that was lifted by the breeze that had sprung up. That was when he saw the blue and flash of yellow below and raised his binoculars, running possibilities through his head. He strained as the colours resolved themselves into the uniform of the policeman below, and he watched for a while. He saw the dog straining at the lead as they worked their way along his earlier path. The dog seemed eager, determined, the cop grim. He turned back to the hawk, but she was no longer there; only some stray feathers marked the spot. Lowering the binoculars, he scanned the trees, but she was gone. He turned and lifted the rifle and pack to his shoulder. Then he pulled the binoculars from around his neck and hung them on a branch of the Poplar he had been leaning on. Running his fingers along the leather strap, he turned and began climbing higher, into the sun. Congratulations to Mike Bergin of 10,000 Birds! He founded the birding blogosphere's biweekly carnival, I and the Bird, and today he celebrates the healthy carnival's one-year anniversary with a themed edition. Mike posed three questions: Why do you bird? Why do you blog? Why do you blog about birds? The participants' responses make for good reading, with similar answers popping up here and there, expressed in various eloquent ways. Kudos to Mike for fostering an excellent activity and community! Why don'tcha take a breather from today's festivities by penning a tale of 500 words that touches on birds, birding or birders? It just needs to include a setting, a character or characters, a conflict and a resolution, and the birds cannot be anthropomorphized. Please send the short story on July 5. You could win a recently published book if your story appears here on the 7th! Kudos to WildBird columnist Noah Strycker! The Oregon State University sophomore writes the Birdboy column in each issue and recently received a $5,000 scholarship. He is one of 80 students who earned the Morris K. Udall Undergraduate Scholarship for his environmental work. According to Joe Hendricks, dean of the University Honors College: "Noah obviously prepared the kind of application and essays that caught the eye of the Udall Scholarship screening committee. He is one of only 19 sophomores to receive the Udall award, which will undoubtedly ensure that he moves on to make significant contributions to our understanding of environmental issues." Why do I bird? Originally because it became part of my job in 1998. That summer, I began working on WildBird, which was my first exposure to "birding" as opposed to my parents' random lessons about local birds. Now I bird because it helps me to reconnect with nature, which my parents taught me to appreciate. While living in an urban environment, it can be easy to lose sight of the natural world. Listening to and looking for birds keeps things in focus. When not walking around a local preserve or the neighborhood, I'm trying to place the birds' calls when they float through the car windows or track a Black Phoebe as it zips around the back yard, snapping up insects. It’s almost second nature now to react to those sounds and sights while going about the everyday routine. In a similar sense, it's almost second nature to blog. This medium lets me share info about birds and nature instantaneously; it's awesome. Aside from the instant gratification, I like the chance to connect with folks who otherwise wouldn't cross my path. I totally enjoy the affiliations that the blogosphere facilitates, and that aspect made me into a blog addict long before I started WildBird on the Fly. The blog lets me further indulge the reporting skills that I learned as a journalism student. 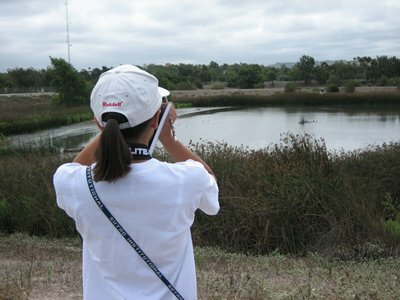 At birding events, I can interview birders, describe field trips and take pictures of the goings-on. While in the office, I get a kick out of going online, finding a news bit that might not have appeared on other birding blogs, choosing the pertinent or interesting grafs, creating the hyperlinks, looking for a photo, pushing that Publish button and immediately seeing how it looks. More appealing than that process, though, is the possibility that someone will read a post, learn something new... and do something with that information. For instance, the post about blind birding included hyperlinks to Massachusetts Audubon Society and the Great Texas Birding Classic. 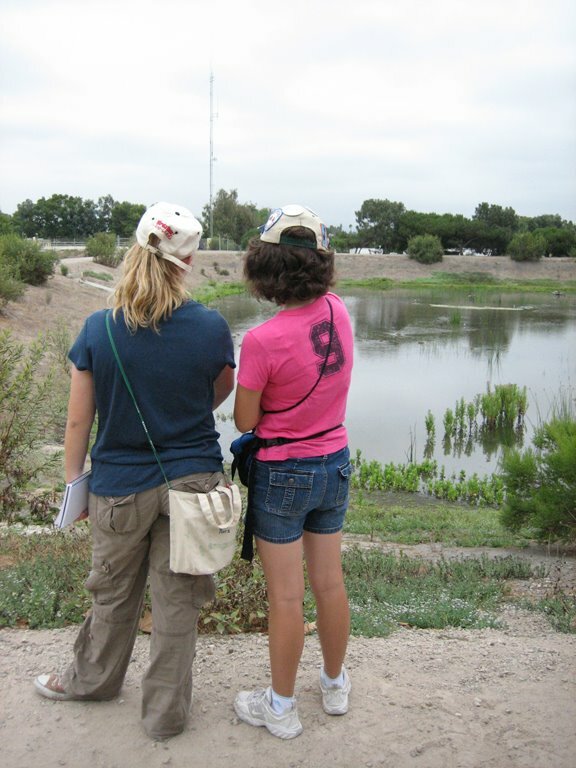 A reader who likes the idea of helping blind individuals learn birdsongs and connect with nature can use the links to contact those organizations and ask for tips about setting up a similar local program. That’s the ultimate payoff for my efforts: readers taking action on behalf of other birders and the birds.